A pie-matched tabletop is comprised of equally sized sectors, like pie slices. Sequential wood cuts, from the same board, are then paired and arranged to create the tabletop surface. Because sequential cuts result in the same grain pattern, the grain-matched results can be quite stunning. Here are some examples. Slices of pumpkin pie are the ideal image for understanding pie-matched tabletops. Steve's Coffee Table is a 16-sector pie-matched tabletop, made of straight grain Macassar ebony. The seams of these 16 pie slices align with the 16 points of the inlaid compass rose. The center of this tabletop is a 6-sector pie-match of holly, surrounded by a 12-sector pie-match of crotch walnut. A ring of 6 inlaid horses decorates the center. The tabletop of the Alton Coffee Table uses a 6-sector pie-match of crotch makore, surrounded by an outer border of mahogany. It doesn't have to be a round surface to use pie-matching. 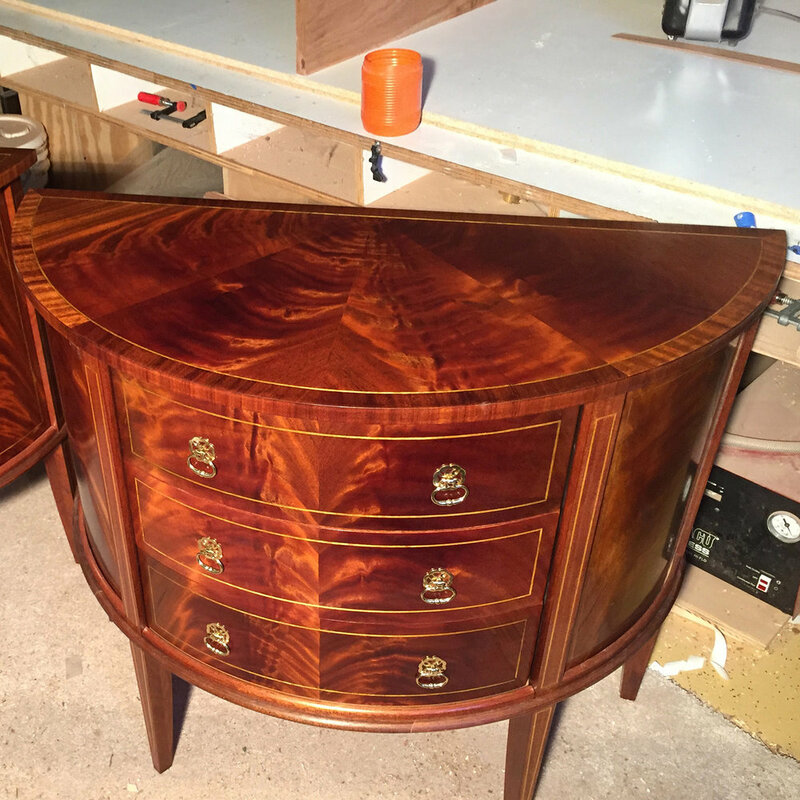 Here, a 4-sector pie match of crotch mahogany decorates the top of this demilune chest. 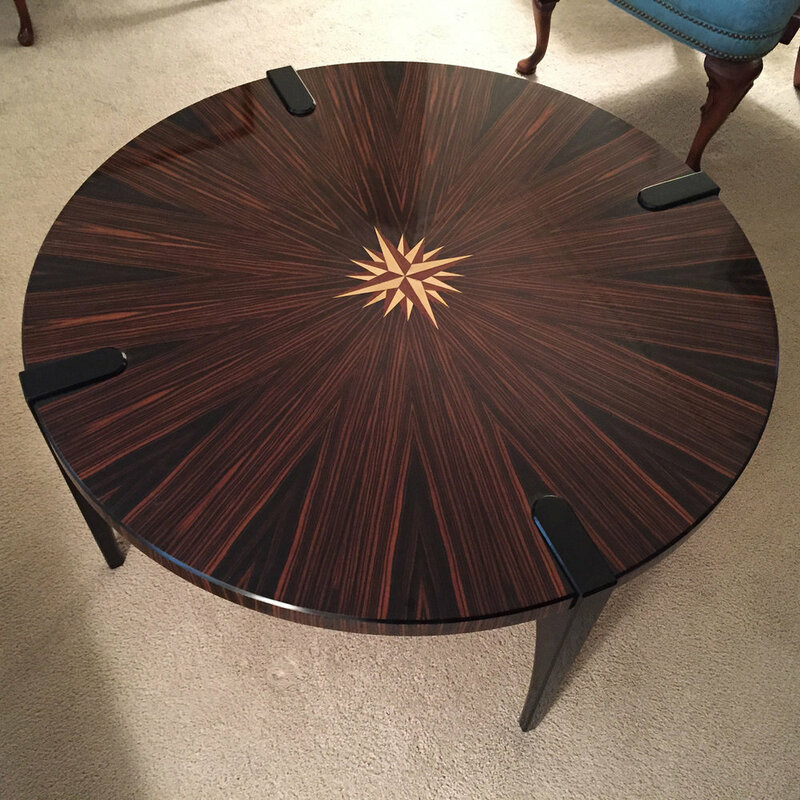 The tabletop of Greta's Coffee Table uses a 6-sector pie-match of cherry, surrounded by an outer border of Macassar ebony.